Become a Banner Partner and save on your next equipment purchase! CrossFit Roar, You Fit CrossFit and CrossFit Broken Hill are recent examples of gyms who have saved $1K - $3K on equipment and received incredible support through the Again Faster Banner Partner Program. With signing up to our Banner Partner Program, you will receive your own referral link to our online store to use on your website, members communication via e-mial, facebook groups etc. You will receive a 10% credit on what your members spend in our online store. Every time one of your members uses this link to order from Again Faster, the 10% kickback goes straight on your account. You can use this credit to purchase new gear - technically, your members will help you get new equipment for gym! Redeem your benefits and get new gear for your gym! Easy! 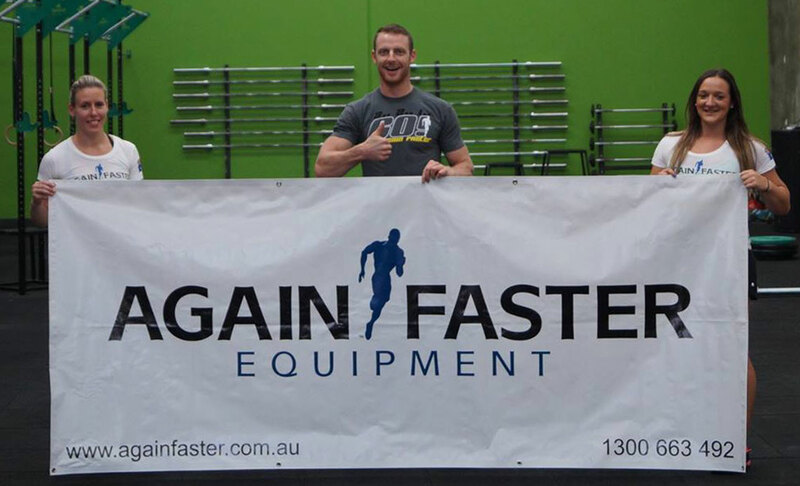 If you already have an Again Faster Banner hanging in your gym, just send us a photo to service@againfaster.com.au for us to showcase on social media and we’ll get you set up for the banner partner program straight away.